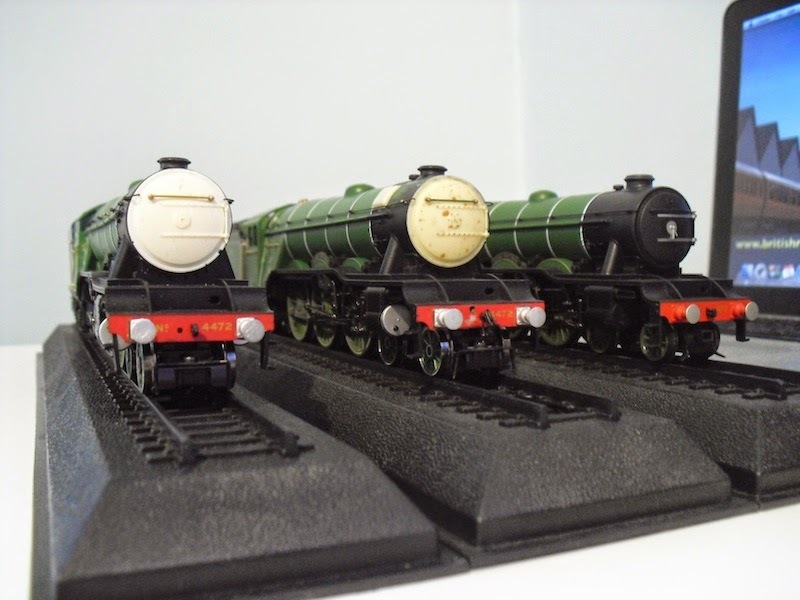 THE BRITISH RAILWAY STORIES LTD: "The backbone of the East Coast main line…The Gresley A3 fleet starts to emerge"
"The backbone of the East Coast main line…The Gresley A3 fleet starts to emerge"
Hornby's Railroad Flying Scotsman. Retooled and then re-released in 2012, complete with an excellent new chassis incorporating a flywheel motor and die cast cartazzi. The heavier chassis runs very well and, in my experience, with a number of them the performance model to model is closer than the sometimes unforgiving super detail chassis. However, we must remember that this new chassis - which only has pickups on the six driving wheels - is derived from the super detail chassis. 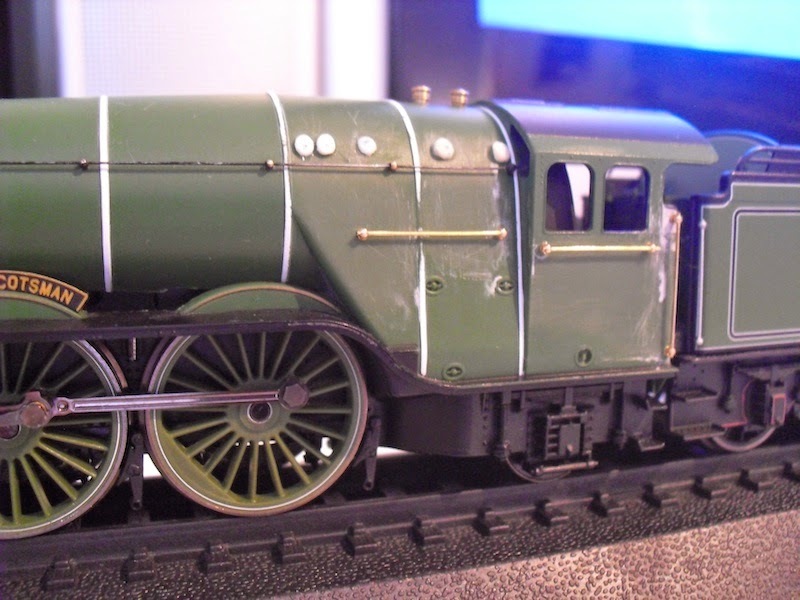 There are some significant changes, not least the excellent flywheel mechanism, the reversion to a three pole motor (although this does not seem to affect the running, which is on a par for the excellent Tornado model from the same stable). 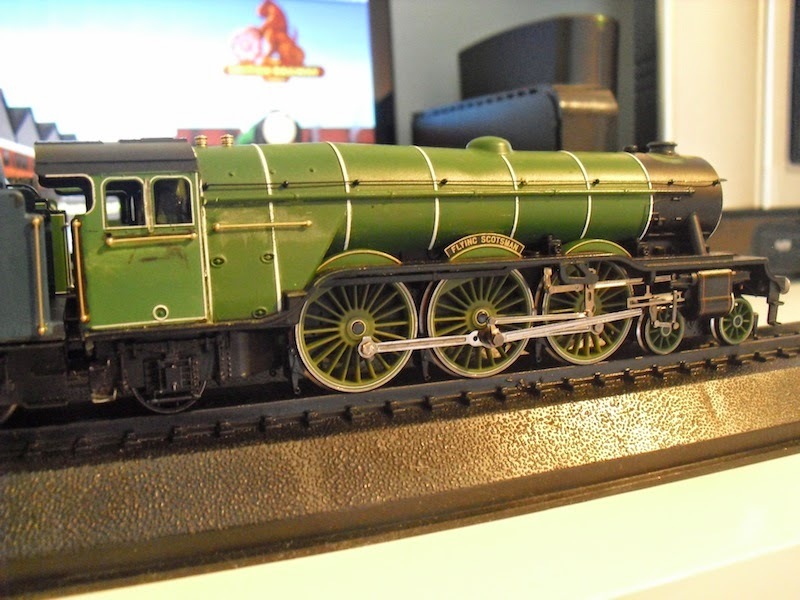 I did a review when the model came out in March 2013 and that can be found here, with a brief overview and potted history of Hornby's 4472 models to date. 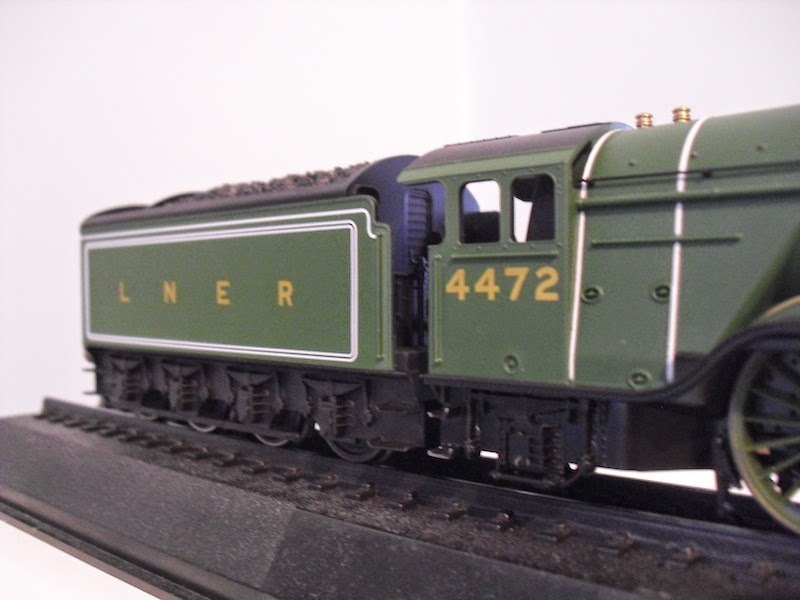 I think it would be fair to say that I have mellowed since that review came out, and that with some careful modelling and mixing and matching of components, the Railroad 4472 has provided some great modelling entertainment for me over the last few months and will in future be providing the backbone of my fleet of Gresley Pacifics. I currently have five of these models in my modelling pile. Four have been picked up with various bits of damage off eBay (two in a week found for £30 and £35 respectively - if you're looking for a perfect as new model, expect to pay between £65 and £80 at the moment) and will in due course be heading for the painting booth once I've finished all of the modifications required. 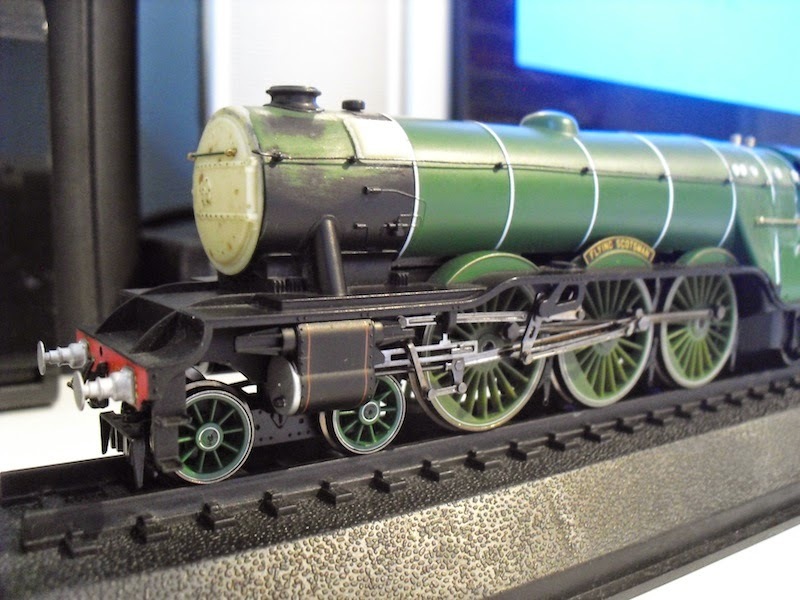 This one is destined to be the only one of the five models to retain its name: it will become Flying Scotsman as she was in 1948, one of the last remaining "A10s" (that's a Gresley A1 with a 180lb boiler fitted), but there are a number of bits and pieces that have had to be changed. Tall chimney replaced with post 1928 shorter chimney. Smokebox door replaced with a resin cast of Hornby's super detail type. The entire cab was cut off using a combination of drilled holes, a scalpel and a set of pliers, and replaced with a Great British Locomotives 4472 cab. This gives us the correct higher cab cut out, cab glazing, sight screens. All moulded handrails replaced with wire ones with brass knobs. The moulded ones were carved off with a scalpel and the cab filed/sanded down to be smooth. Replaced the driving wheels with fully lined out X9323G type. Replaced the front bogie (which is a Thompson type, and with smaller driving wheels) for a X5086G type with fully lined out wheels. Replaced the unlined cylinders with the lined out and burnished X9561 type. 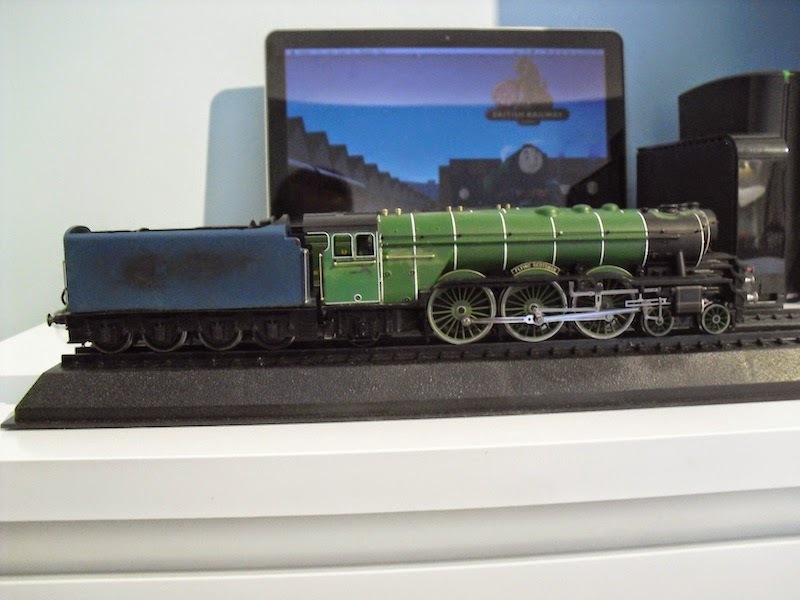 Resin superheater washout plugs from Graeme King's range will be added to the smokebox on this example. I have currently run out and am waiting on supplies. The other 4472 model sports these currently. They are excellent additions. 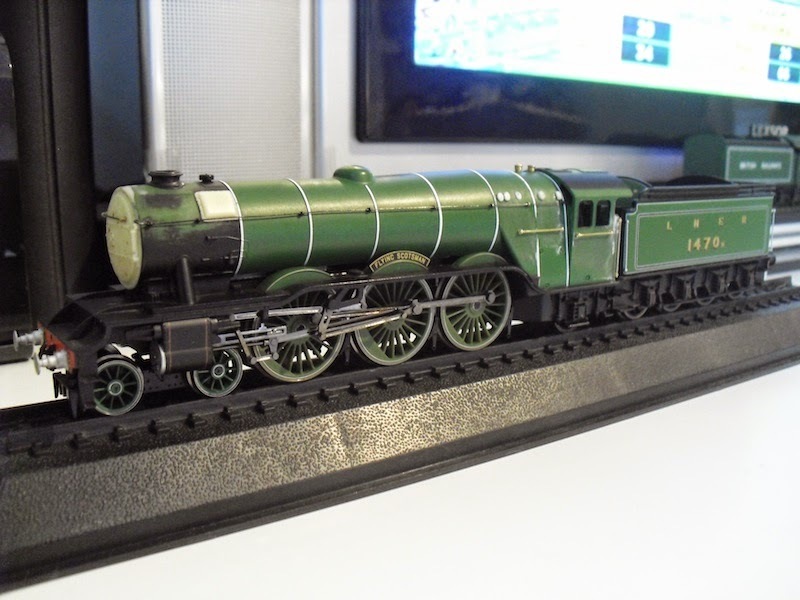 The tender has been totally replaced with a set of Hornby super detail frames, and one of the Great British Locomotives Mallard tender body shells. Moulded handrails all round removed with a scalpel, holes redrilled out and handrails fitted as per the modifications to the body. Lanarkshire Model & Supplies whitemetal buffers fitted to the front buffer beam by chopping off the originals and filing down the buffer beam. Holes then drilled out and the buffers glued in place. Buy them here. No link to the business just a very satisfied customer. The one major thing I won't be changing is the boiler type, which for 4472 (as no.103) in 1948 was still the original 180lb boiler. Therefore the washout plugs will remain untouched on this example. I have done some work on another of these models previously, back in October of last year, and you can see the difference in approach to the problematic cab area. On the older project, I added an extra piece to make the cab cut outs the right height. I will on all future models take the approach on the newer project, by replacing the cab altogether. 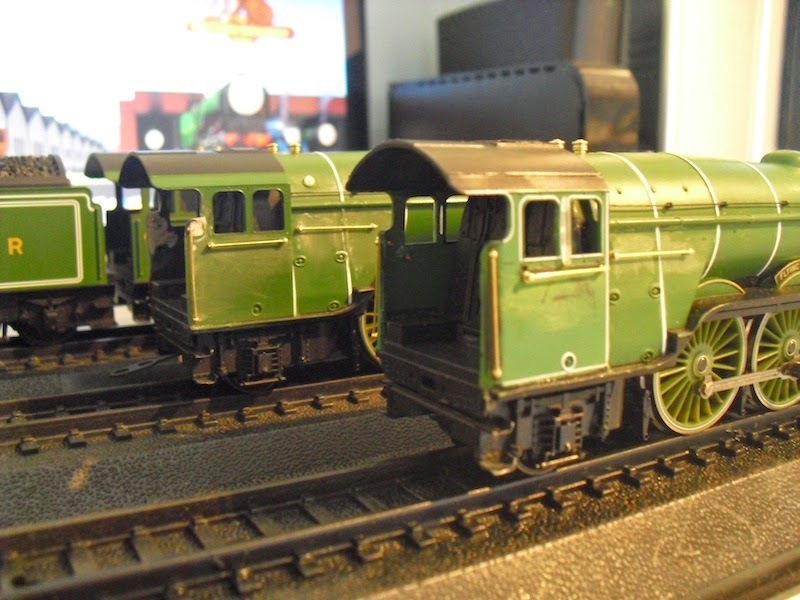 For £9 each, the Great British Locomotives 4472 models have given me an excellent supply of cabs and tenders suitable for my A4 Pacific conversions. Notice how I have managed to change the coupling to be on the locomotive rather than on the tender on the model in the background. This works much better than the coupling being on the tender and allows a variety of tenders to be attached to the locomotive. On the previous project (which is destined to become no.60110 Robert the Devil) I replaced the original washout plugs to change the boiler type to the round domed A3 type. These can be seen quite clearly in this close up of the firebox area. Note also the replacement handrails. The change to the face of the front end is quite clear in this view with the replacement smokebox door, chimney and Graeme King superheater headers. The whitemetal buffers also add to the improvements, and the coupling (from a Hornby L1 super detail pack) is also a pleasing touch. Additions that I could make at this stage are the grab handles on the curved sections of running plate and the middle cylinder cover (one I think I need to experiment with to make a resin cast for a uniform look across the A3/A10 fleet). So for the moment, that's it on the Gresley A3 fleet. All are left hand drive, I must add, except for one which I hope I will be able to start and finish the physical modelling over the course of this week before I go up north for a running session at the end of this coming week. I may well have no.103 in tow with me as I'm quite proud of how she's turning out. Certainly I am enjoying the modelling a lot. 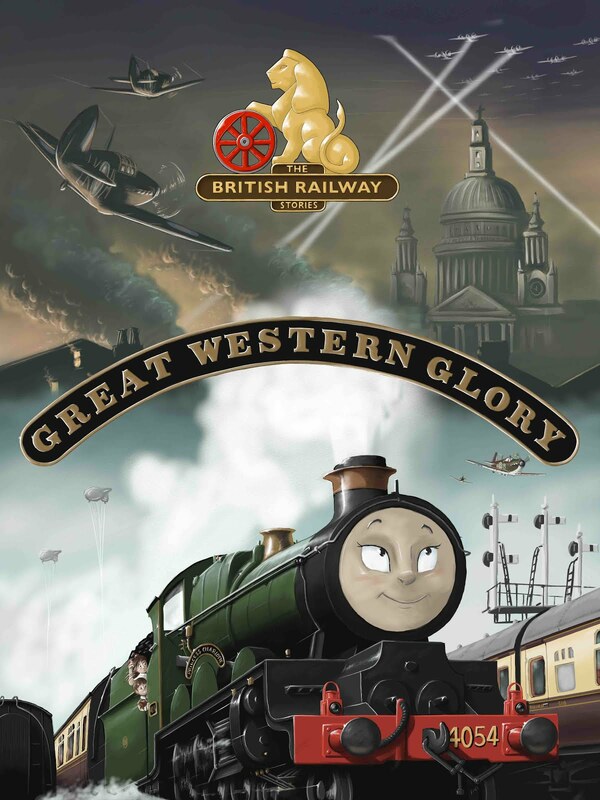 It's giving me the locomotives I want and I'm learning new skills and gaining new ideas all the time. It's been a great exercise. So on that basis, I owe Hornby a small apology. The Railroad 4472 is still overpriced as is, but second hand and with some ingenuity, you really can turn these into rather convincing models I think. A better modeller will produce something far better than I, I suspect, but for now I am enjoying the journey. One last thing before I call it a night. 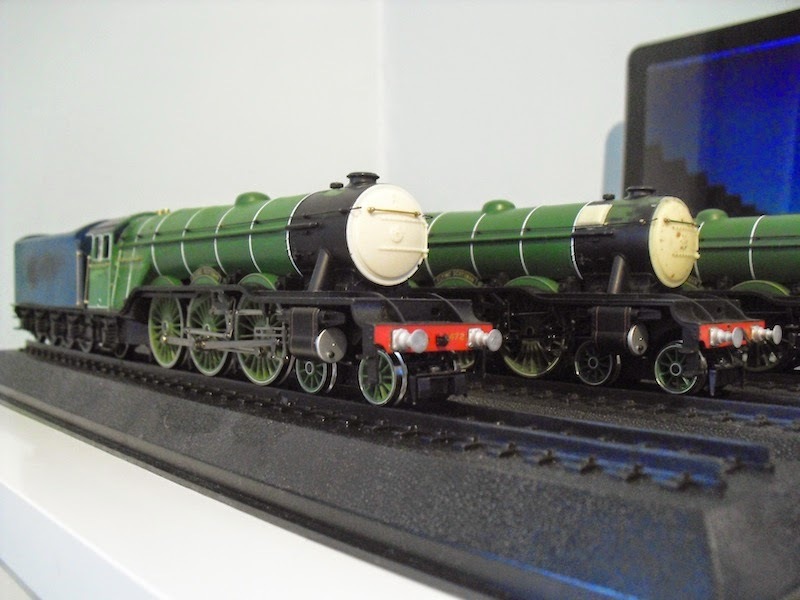 The locomotives I am modelling are as follows: no.60 The Tetrach (LNER livery), no.97 Humorist (LNER livery), no.103 Flying Scotsman (LNER livery), no. 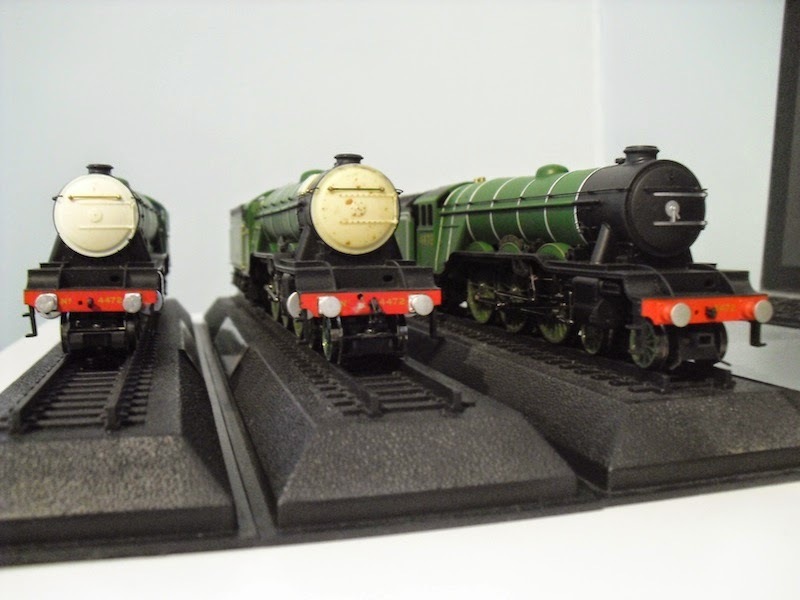 60110 Robert the Devil (BR branded LNER livery) and no.60112 St.Simon (BR branded LNER livery). All apple green, all very different in a number of details and one in particular a slightly more difficult build than the others (Humorist will require changing from left hand to right hand drive and a few other details swapped too). Could you make a post on how to make the Non Corridor tender? As i am trying to make/order one myself. 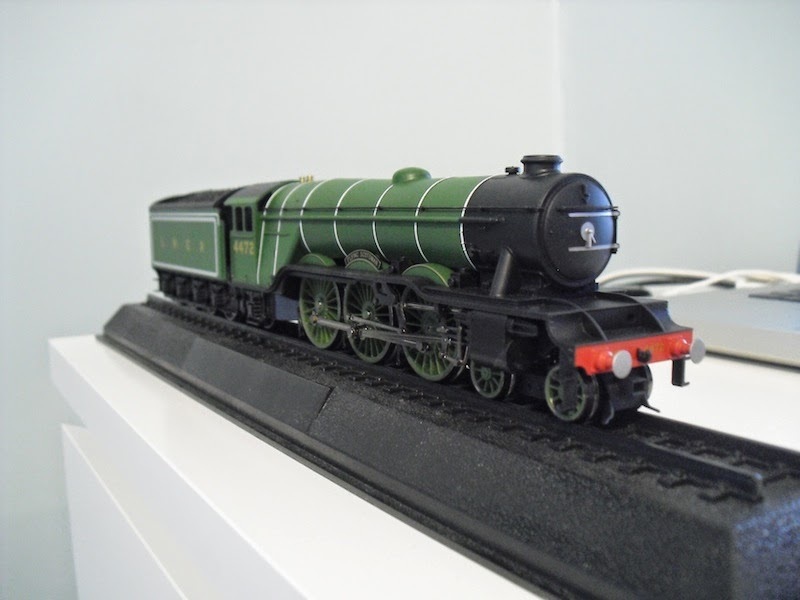 "AJModels J50/3 tank engine "